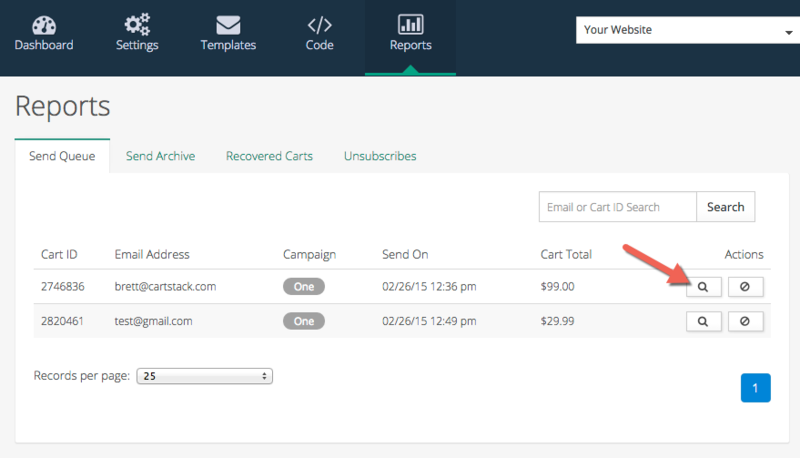 The setDataItem is a way to pass custom data into CartStack so it can be used to personalize your email templates. It's often thought of as our custom fields solution. Once the data has been passed into our system you can display it by adding a simple variable to your email template. This shows two custom fields: first name and coupon code. This shows tracking and capture for the first name. To test your custom fields integration, abandon a cart on your website (make sure you've added the appropriate variable to your email template, eg: %%firstName%%). Then log into your account and go to the Reports > Send Queue report. Then click on the view icon (see screenshot below). You will see the actual email that will be sent out, so you can make sure the custom values are displayed.